As we finish our corn harvest in 2018, we have noticed an increasing amount of information pertaining to tar spot circulating through the agronomic community that is not entirely correct. Let’s take a minute to clarify some of the more commonly encountered rumors and set the record straight. Tar spot on corn is the same as tar spot we see on maple trees. -False. Tar spot on corn is caused by Phyllachora maydis. Tar spot on maple trees is caused by Rhytisma acerinum. One of the issues with plant pathologists is that we like to use common names for diseases. Unfortunately that results in different diseases occasionally having the same common name. The same is true with downy mildew on Lima beans (Phytophthora phaseoli) and other downy mildews, such as those on cucurbits (Pseudoperonospora cubensis), and soybeans (Peronospora manshurica). Three diseases with the same common name, but caused by three totally different organisms. Fisheye lesions are produced by Monographella maydis, and that is what caused fisheye lesions on corn this season. Somewhat false. In Mexico fisheye lesions are associated with M. maydis. In the United States, M. maydis has yet to be associated with any fisheye lesions, despite assessing hundreds of lesions from different locations using multiple techniques. Just because something is associated with lesions does not mean it causes the lesion. In addition, we have a very different climate and environment compared to Mexico and Latin America. Therefore, it is entirely possible that another organism could be involved. Finally, it is possible the the lesions are caused by Phyllachora maydis and some sort of interaction between fungal population, the particular hybrid, and the environment..
Tar spot pathogens toxins that can hurt your cattle, etc. -Many plant pathogens (e.g. bacteria, fungi) produce toxins that help the pathogen trick plant defense responses or kill plant tissues. This does not mean that the toxin has an effect on humans, cattle, swine, etc. Fungi such as some Fusarium spp., Gibberella, and Aspergillis produce toxins that can have severe detrimental effects on animals and humans. In parts of the state and nearby states we are suggesting to test corn for mycotoxins because the weather was favorable for ear rots that can produce these toxins. Lodged corn also comes into contact with soil borne fungi that can produce these mycotoxins. To date, have no evidence indicates that tar spot causes ear rots or produces harmful mycotoxins. That should not prevent you from testing your silage and grain. -Unknown. Nobody has conducted any replicated studies over many sites and years that have tested these effects. In addition, it is not known how far the pathogen can spread during a sporulation event. This pathogen overwinters in residue, but if it can travel long distance as spores, the overall impact on the disease at a local scale may be minor. This could be similar to fusarium head blight on wheat where, given the right environment, the disease can increase to a level where subtle management impacts may not be easy to discern. False. 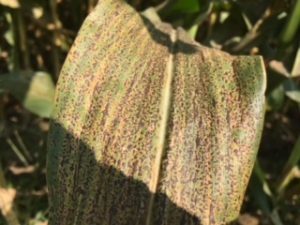 This disease has been in Illinois since 2015 and has been observed every year since, often in the same areas and fields. In sum, we do not know very much about tar spot on corn in the United States. It will take time to generate quality data and information for the agricultural community. Plant pathologists in the region are working together to generate this information and share it with you as soon as it is available. Next PostLate season stem discoloration in senesced soybeans- what caused it?